The Ministry of Transport organized a conference on traffic network connectivity in the Mekong Delta and Tran De seaport plan in Soc Trang province with the attendance of Minister Nguyen Van The and leaders of 13 provinces and cites in the Mekong Delta and HCMC. The Mekong Delta accounts for 90 percent of the country’s rice export output, 70 percent of fruit and 60 percent of seafood. Most of goods have been transported to HCMC for export causing overloaded road system. Currently, the Mekong Delta has four modes of transport including road, inland waterway, seaway and airway with the total volume of goods reaching 131.7 million tons in 2017. The goods volume increases by 6.2 percent year-on-year. Waterway transport accounts for 70 percent of cargo transport volume and roads 30 percent. Road network now comprises six vertical and nine horizontal axes. However vertical routes have not fully been built including Trung Luong-Can Tho expressway, N2 Road’s stretch Duc Hoa-My An-Cao Lanh, N1 Road, Highway 60’s stretch from Rach Mieu bridge to Co Chien bridge, Dai Ngai bridge and Rach Mieu 2 bridge. In addition, horizontal routes linking up provinces in the delta have not been done, comprising Chau Doc-Can Tho-Soc Trang expressway, Highway 30’s stretch Cao Lanh-Hong Ngu, Highway 1A’s stretch Nam Can-Dat Mui. 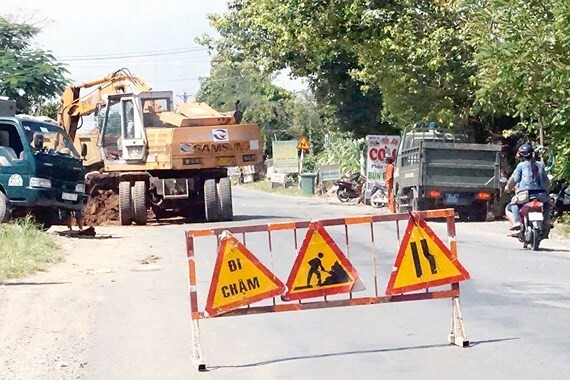 Therefore leaders of Mekong Delta provinces proposed the Ministry of Transport to continue investing in roads connecting provinces and cities’ centers in the region including Highway 54 in Vinh Long and Highway 91 in Can Tho city. In addition, they suggested upgrading and broadening of Highway 60 and Highway 53 and on schedule construction of key traffic projects such as Vam Cong bridge, Trung Luong-My Thuan and My Thuan-Can Tho expressway, Rach Mieu 2 bridge and My Thuan 2 bridge. Mr. Phan Van Sau, secretary of Soc Trang province Party Committee, said that the Party Central Committee and the Government always focus on the Mekong Delta traffic connectivity project, have issued many policies to speed the project. The project points out obstacles and the status quo of traffic infrastructure system in the Mekong Delta, suggecting solutions to clear congestions and increase connectivity. The Unconnected traffic system has slowed down the development of the region in many aspects. Traveling about 250 kilometers from HCMC to Soc Trang takes up to 3-4 hours now. If the current traffic system is broadened with intensified connectivity and removed congestions, it will vigorously boost development for each locality and the entire region, he added. At the conference, the Ministry of Transport presents a report on Tran De deep water port plan to take opinions from localities in the Mekong Delta before submitting plan to the Prime Minister for consideration. Tran De seaport will have the total capital of over VND40 trillion expected to be mobilized from the society. Two locations have been proposed for the port construction, the first place is at Tran De estuary and the second one at My Thanh estuary. The port has the total area of about 5,750 hectares with logistics service area covering 4,000 hectares and 10-16 kilometers of bridges connecting the offshore seaport and the mainland. According to its design, the port will be able to handle vessels of 50,000-16,000 DWT. Explaining reasons for choosing Tran De to be type 1 deep water port for the region, Minister of Transport Nguyen Van The said that the port is only about 50 kilometers from the center of Can Tho city. In addition, the area where the port construction is planned has Highway 1A, Nam Song Hau Highway and there will be an expressway to Phnom Penh in the future. 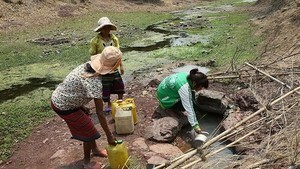 Secondly Tran De is located on the bank of the Hau river. Currently cargo transport has mainly used the Hau river instead of the Tien river because of narrow estuary, creating a waterway route from Cambodia to An Giang, Can Tho and Soc Trang. After learning plan report documents, most delegates at the conference agreed with building a deep water port for the entire Mekong Delta region. The port will be a gateway for the region’s direct export import activities contributing in socioeconomic development and national defense and security. Agreeing with the seaport plan, deputy chairman of Hau Giang province People’s Committee Nguyen Van Tuan said that besides playing the role of a cargo export import gateway, Tran De seaport will also meet coal import demand of three thermal power plants in the region. After taking opinions from localities in the region, the Ministry of Transport and relevant sides will complete the report on Tran De seaport plan to submit to the Prime Minister by the end of this year.